1. With multifunction: submerged arc welding, carbon arc welding, carbon arc air gouging. 2. With better capabilities by using technology of digital controlling and perfect protection function. 3. Suitable for working on various spots with novel design and three protection treating method. 4. 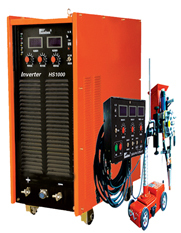 Suitable for welding from all position with agile automatic wire feeder. 1. Suitable for stainless steel, carbon steel, iron, copper and titanium and related alloy. 2. Widely used in the industry of chemical business, boiler, pressure metallurgy, electric power, shipbuilding, pipe and metal structure.